Christian charity Scripture Union England & Wales has urged churches across the nation to increase their outreach work with children and young people, as part of The 95 Campaign. The new campaign, which focuses on the alarming statistic suggesting that 95% of children and young people don’t go to church*, has been launched by the charity in their 150th anniversary year. It is hoped that churches would join in a united vision to take the good news of Jesus beyond the church to reach young people, and that the campaign will help educate, motivate and resource churches to increasingly look outward in their children’s and youth activities. Tim Hastie-Smith, National Director for Scripture Union England & Wales says, “If today’s young people aren’t in church, we need to step out and take the good news to where they are. We can’t wait for them to come to us. By supporting the campaign, churches and Christians will be able to join with others to learn and share experiences, receive free resources, advice and funding, and ultimately ensure children beyond the church have many more opportunities to meet Jesus. As well as encouraging more 95-focused mission, Scripture Union will lead discussions and facilitate learning through the campaign, creating opportunities to listen and learn from both young people and practitioners to better understand their needs. The 95 Talks, keynote speeches by thought-leading children’s and youth workers, will be live streamed throughout 2017 and The 95 Census, a survey for children and youth assessing the state of ministry, will identify the areas that need improving and remodelling. The campaign is also seeking to provide resources and financial support to existing outreach activities. To this end, SU have set up a Good News Fund to provide churches with investment to see their initiatives get off the ground, and many free resources will also be developed based on learnings from the campaign. 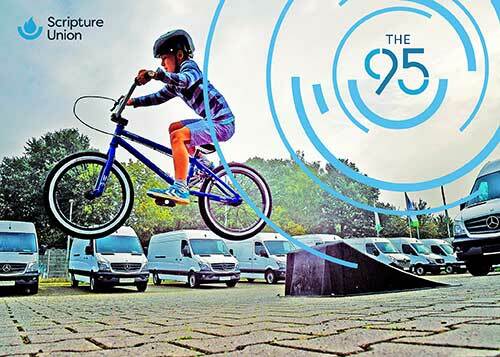 You can find out more about the 95 Campaign, or sign up to be a part of the initiative, at www.the95.org.uk.